Happy Sunday! 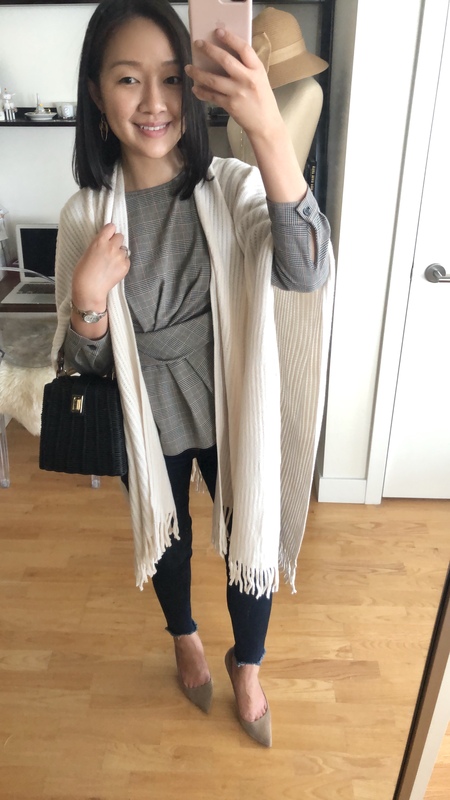 I love this plaid statement blouse which I had to have as soon as I saw it online. The plaid is on trend and the pleats make this piece really stand out. I am usually size 0P but I sized down to size 00P which fits me well. Size 00P measures: 23″ shoulders, 31″ bust, 20.25″ sleeve length, 22.5″ total length and 28″ waist. The material is 64% polyester, 33% rayon and 4% spandex and it has some stretch to it. Shipping Tip: Sign up for ShopRunner and enjoy free 2-day shipping on minimum orders of $25+ at Ann Taylor (and a lot of other retailers that are part of ShopRunner network). Being a member of ShopRunner allows me to buy exactly what I want without adding filler items to my shopping cart. You also get free mail returns on ShopRunner online orders. Sign up for ShopRunner via PayPal for a free 2 year membership. ShopRunner is also a complimentary service for AmEx and Elite and World Mastercard holders! Note: If you typically shop a lot in stores I would recommend getting a Cares card from Ann Taylor or LOFT (works like a savings card) so you can save more now through November 15, 2018. With the Cares card (valid on in-store purchases only) you get an extra 20% off on top of current full-price sale promotions (Cardmembers get an extra 25% off) on purchases of $100+. 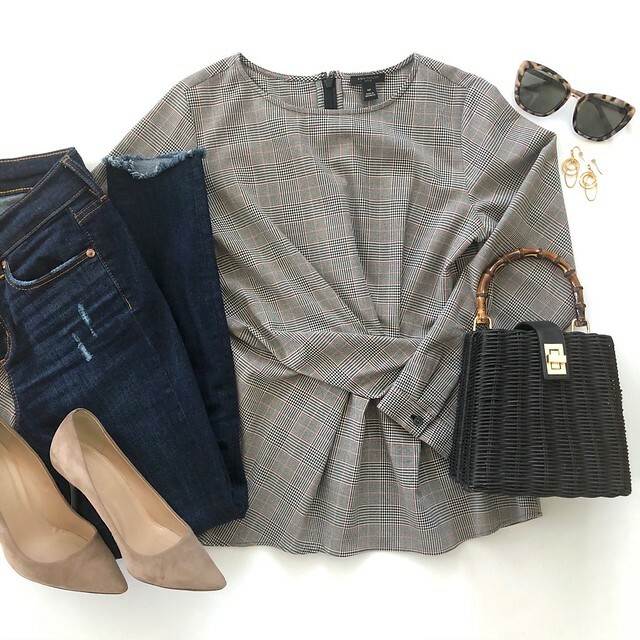 Valid at LOFT, LOFT Outlet Stores, Ann Taylor, Ann Taylor Factory Stores and combinable with current in-store offers on full-price promotional purchases of $100+. 90% of the Ann Cares cards’ purchase price is donated to BCRF. 90% of the LOFT Cares cards’ purchase price is donated to St. Judes Childrens Research hospital. The promotion ends November 15, 2018 for both savings cards. Both the Ann Cares cards and LOFT Cares cards work across the aforementioned Ann Inc. brands for in-store use only. More LOFT reviews are on the way! I have oke more LOFT package coming mid-week. FYI. I believe a cyber sale (with free shipping) is coming next week when I checked my sale archives. Thanks for both your Ann Taylor and loft reviews. As a petite person love them both and I always check out your blog for sizing! Keep up the great work. Jess, there is plenty of Ann Taylor and AnnTaylor Loft to go around for everyone. I appreciate your reviews on both!!! You reach more viewers by doing both. I happen to shop more at Ann Taylor than Loft for some reason. I like them both though! Thank you for this post. I was just perusing the 50% off sale and was trying decide what to purchase:). Thanks for the info about your hair loss. 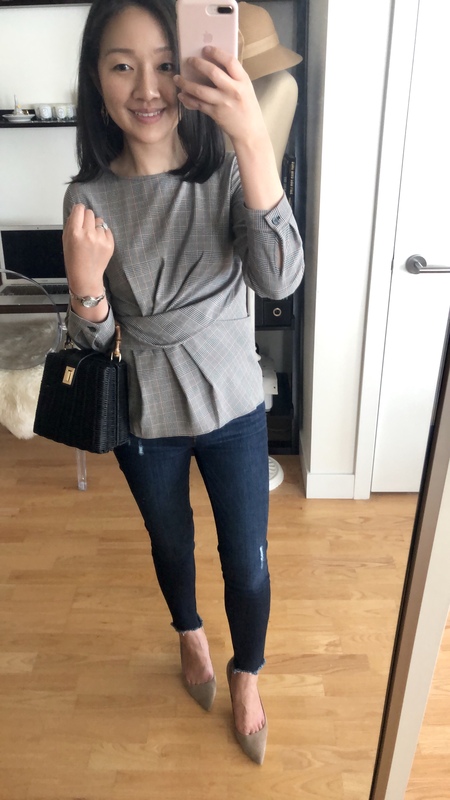 I read your blog all of the time and purchase many of the things you suggest…it saves me time and stress when I can see how something looks on someone my size. I have the same type of hair loss that you have…I have high testosterone and DHEAS…I had a PCOS dx in the past but seem to cycle regularly now. I bought the Invigorating Hair Oil from Mountain Rose herbs recently and it has rosemary, peppermint, jojoba, etc…I have been afraid to use it. Thinking of going on Spironolactone also. My doc suggested birth control, but there were no guarantees my hair loss wouldn't get worse now or later. That deterred me. I've been feeling down about it, and I was comforting to see that someone like me who was my age was going through the same thing. Hi Abby, Thank you so much for reading my blog and purchasing my suggestions! I'm sorry to hear that you are experiencing hair loss too due to your hormone levels. I've had hyperthyroidism since 2004 and combined with stress my hair has gone through a lot over the years. I haven't heard of that hair oil or Spironolactone before for hair loss. I had read about Rogaine for women from @agelessstyle's post (https://www.instagram.com/p/Be5kn0UA9p3/?utm_source=ig_share_sheet&igshid=1ogutk4g3qvom) but I didn't want to have to use that on my hair indefinitely. I then looked into natural remedies and I liked the option of using natural ingredients to treat hair loss which is how I ended up trying Castor oil after watching quite a few YouTube video reviews. My father in law had male patterned (hereditary) hair loss but my mother in law diligently massaged an egg white mask on his hair daily and now he has a full head of hair with no bald patch. Personally the idea of applying egg whites on my hair sounded really messy but eggs do have a lot of nutrients in it. I'm convinced that massaging your scalp may help with hair growth in addition to whatever else you choose to apply to it. Everything worthwhile takes time to see results so just be patient if you do decide to try something new. It was the nicest feeling when my coworkers commented on my hair recently because they have noticed the changes. Yes, I especially like when you mention when the sleeves of a sweater aren't wide enough for layering. Someone in the dressing room at Loft yesterday was complaining about how the sleeves of the sweaters there were too narrow while the body was too wide. Take note, Loft! I even bought one of your rejects yesterday, the L&G tweed hoodie, because I'm a little wider than you and it was below 60 degrees/everyone was dressed in long coats and booties/my throat was scratchy. It was like wearing a hug. I do have that Revlon brush and I tried the other brand of hot brush that Sephora had last Christmas and it didn't work for me on the recommended heat setting. Wonder if I'd like the Drybar version better, even though it looks exactly the same. I agree with you on the Rogaine. Do you have to use castor oil indefinitely as well? If you do, I suppose it is better than Rogaine. That's so interesting about the egg mask and the results your fil had. Did the mask have castor oil in it? I'd put eggs in my hair! Haha. Yes, some people even use one of those rollers with their hair oils, so massage is good. I'm sorry about your health issues and stress, but I'm glad you found something that works for your hair. I didn't even really notice that you had thin hair, though. I've just been focusing on the clothes, I guess! I'm glad I'm not the only one that doesn't like snug sleeves. That tweed hoodie is really cute so I'm glad it worked out for you (and feels like a hug). The Drybar version makes my hair go flat but I admittedly probably do not know how to go about using it to its best advantage since I'm not good at doing my hair at all. Once my hair improved I wasn't as strict about putting it in my hair every night but I do put it in when I remember now. It seems to help my hair grow faster and longer so my bad haircut from the beginning of September grew out but I may get another trim to put in some long layers with my preferred stylist. My MIL had used a fresh egg so it wasn't a mask per se but a mask in the sense that she massaged it into my FIL's hair and he left it in his hair and then washed it off. I didn't show my face or hair as much in years past so there's probably not a lot for anyone to go by. 😉 I probably only shared my hair if I got a decent hair cut or in the very rare occasion I curled my hair which I haven't done in a long time. I enjoyed being fairly anonymous (headless and faceless) for years.